Bikeland congratulates Big K on this milestone. 50 years of giving American bikers 2 wheeled machines worth being excited about. Happy Birthday Kawasaki USA! 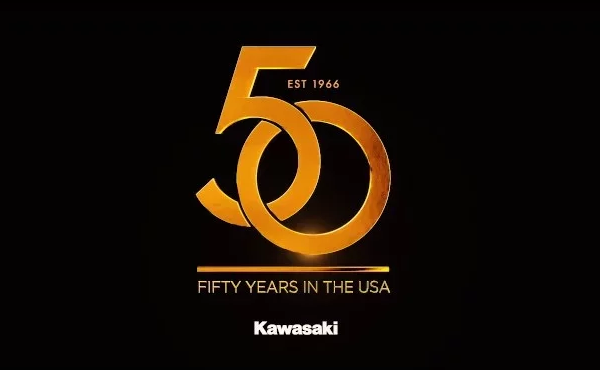 Exactly 50 years ago today, on March 1, 1966, American Kawasaki Motorcycle Corp. (AKMC) opened for business in Chicago, with a modest sales office at 208 South La Salle Street and a two-story parts warehouse at 2860 North Lincoln Avenue. Formerly the site of a meat-packing plant, the warehouse needed serious renovation, but the price was right for a company trying to gain a toehold in a vast new country. Welcomed by Tony Watanabe with Ted Tazaki, who led the charge to establish the Chicago office, just 50 people attended the grand opening, held at the nearby Continental Hotel. But it was the right crowd, including the banks, trading companies and distributors that would support the company’s early efforts in America. Like other Japanese manufacturers in the early 1960s, the parent of AKMC, Kawasaki Heavy Industries Ltd. (KHI), viewed America as a highly attractive place to grow its brand. The industrial giant had already joined the motorcycle industry in 1961 by adding a factory to build engines for Meguro in Japan, and now was ready to grow further as a complete bike manufacturer. Although KHI was already well established in heavy industry, tapping the promising United States motorcycle market would prove anything but easy. Japanese competitors were already operating here, and KHI reasoned they would be hard to beat. But despite some early setbacks, a small group of eager young executives and managers were committed to improve on the AKMC’s initial two-percent market share. AKMC had previously engaged several regional distributors to cover virtually the entire country, and thus selected Chicago as a central location that would be convenient to all. One address was devoted to paperwork and another to parts, while machines were to be shipped to distributors directly from U.S. seaports. Increased interest in motorcycling on the West Coast caused AKMC to move its headquarters to Gardena, California on November 1, 1966. Kawasaki Motors Corp., U.S.A. (KMC) was formed through a merger with AKMC in 1968, leaving the short-lived Chicago offices as the historic starting point for Kawasaki in America. Today KMC has nearly 1,100 dealers in all 50 states and offers a wide range of products in five categories, including streetbikes, off-road motorcycles, ATVs, MULE™ utility vehicles, and JET SKI® personal watercraft. Many of the 4-wheel product and personal watercraft are assembled at Kawasaki Motors Manufacturing Corp., U.S.A. in Lincoln, Nebraska.